This guide helps you to create new user profiles, using the 'Profile Custom Content Type' plugin. Go to your Dashboard > Profiles. Here you can add a new profile by clicking on the 'Add New' button. Complete all of the necessary fields - if you don't have all of the information, you can always save your profile & come back to edit it again. Once you have entered information into your profile, hit 'Publish'. This will save your profile and also update it on your website if you have any pages/posts that refer to your profile. 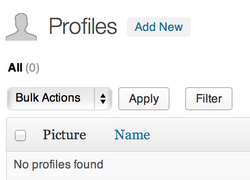 To view a list of profiles / or to see your profile (depending on your access) - go to Dashboard > Profiles. You may not have been invited to the site - this means that you can login & see your Dashboard, but under the 'My Sites' area (top left) you don't belong to any sites. In this case, contact the site administrator to invite you to the site. In order to use Profiles (even if you have been invited to a site/blog) - you will need to sign up for a CMS account. Once you have signed up for an account, you'll then need to be invited to the site - contact the site administrator for this.